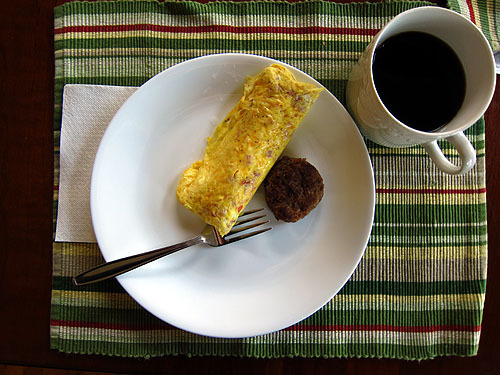 While I was away for Thanksgiving visiting family one of the breakfasts we made were these boiled omelets. We set out things to add (chopped peppers, onions, cheese, crumbled bacon or sausage) so that each person could construct their own. The recipe was originally shared as a way to make breakfast aboard a boat so that there were fewer large items to wash. Since the recipe says you can make up to eight at a time it means everybody can get omelets at the same time. They even came out looking scrumptious! This works great when you have a group of people together. 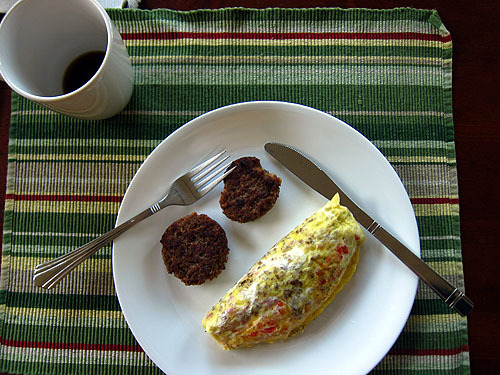 No one has to wait for their omelet, everyone gets involved in the process and it’s a great conversation piece. Crack no more than two eggs (large or x-large) into each bag and shake to combine. Put out a variety of ingredients such as cheeses, ham, onion, green pepper, tomato, hash browns, salsa, etc as selection. Each guest adds prepared ingredients of their choice to their bag. Shake, carefully press air out of bag and zip it up. You can cook 6-8 omelets (bags) in a large pot. For more bags, make another pot of boiling water or cook in shifts. I believe you have just made sous vide eggs. Megan! This would be soooooo awesome for camping! You can pack the little ziploc eggies ahead of time and then just boil water for breakfast. Someone educate me. Do ziplock bags contain BPA? If so would boiling them be dangerous? Looking forward to trying these with the family for Christmas break – if my snob husband will condescend to try one. What a great idea! Making omelets individually takes forever. I love @SAWK’s idea of doing it for camping, too. Sounds a lot like my dad’s recipe for Dishwasher Salmon. Will it work with egg whites? Do you think you can substitute the eggs for egg whites, such as the egg beater egg whites? Steffy – Yes, I don’t think that would be a problem at all. You might even be able to cut the cooking time down a bit. This is genius – especially for camping! Woah I’m definitely trying this! Sounds like it’d be something good I could take with me to work. I could prepare them at night and then boil them while getting ready. These are great for camping/large groups. One time, I went camping with a bunch of people, and they did this. Make sure to use the freezer bags, the thinner kind will melt in boiling water. Another cool idea I saw that weekend was somebody had taken a keg and converted it into a pot you could use to boil the water in over a large propane burner like you’d use to boil oil for frying turkeys. It was great. I saw you addressed the question of eating food made with heated plastic for yourself and I admit it is a clever cooking method that I wish I could feel good about myself. But I can’t. I try to avoid plastics, even cold, coming in contact with my food. Not because of media hype. Just because it makes sense to me to avoid ingesting these chemicals, especially since we get enough via other means as you point out. As a former Girl Scout leader who has tried this several times I have one thing to say: Pass the Frosted Flakes, please. Brilliant – I can’t wait to try this! And to those who suggest it for camping – double brilliant! THIS IS GENIUS. I’ve always been too intimidated to attempt omelettes (one of those things that looks easy but I know is secretly super difficult), but this might be the great equalizer! in a plastic bag? sorry but that’s not good…. Intriguing…. I would rub the inside of my bag with butter first, just for the flavor! It would be fantastic to figure out a different container option. Personally, I can often taste the plastic in things and nothing creeps me out more than melted plastic. @sarah – i think eggs would seep through cheesecloth. Such a fun idea! I especially like that it feeds a ton at once. There is an old camping recipe for doing this in a paper bag. Instead of the boiling water, you poke a stick through the folded top and hang it over your campfire. I am some kind of plastic bag miser so I’m more shocked at the idea of using that many plastic bags at once! This is standard camping fare for us. Huge fan of not scraping egg bits out of a cast iron pan. You can also crack eggs into bags ahead of time & keep in your cooler, if you’re concerned about whole eggs getting crushed. I immediately thought of camping! Apparently, I’m not the only one. Can’t wait to try this!! Can I boil in Ziploc® Brand Bags? No. Ziploc® Brand Bags are not designed to withstand the extreme heat of boiling. Alternative: Pour eggs/fixings into Ziploc Zip’n’Steam bags and microwave. Timing varies, but start checking somewhere in the three minute range.You can only do one at a time, BUT you don’t even have to boil water! This is fantastic!! Thanks so much for sharing – I can’t wait to try this! Popular with scouts on campouts. Quit whining y’all. If you don’t want to try it – no need to comment about how bad plastic is and how one cannot boil ziploc bags! I think it’d be fun for a big fam reunion, esp. for the little squirts. My bags melted… Took me ages to clean The pan. @Olive – It seems to me that the comments section is the appropriate place to express doubt over the efficacy and safety of boiling plastic bags. Olive, Amanda and everybody else – I’m more than happy to let people voice thoughts about this technique here in the comments. Let everybody say what they want and if you don’t agree so be it. Erica – I’m so sorry to hear! Did you use the freezer bags the way the recipe calls for ? Can you let us know what might have gone wrong? We have been doing this for years. One of our favorite meals when we go to Lake Powell. Make sure to use freezer bags. After the eggs and other ingredients are in the bag squish the bag up really well to mix everything together. They are delicious. I tried this last night with off-brand (i.e. not Ziploc) freezer bags, and it didn’t 100% work, but the results were promising! I was thinking about whether we could make these like boiled eggs (bring water up to boil with bags/jars in it, then put a lid on top and turn off pot for @14 min) – if I get the time, I’ll try it and post my results in comments. People, I would like to do this too, but it’s not safe. Just because people point out that it isn’t safe, doesn’t mean they are trying to take away your fun activity. Stop being angry at the plastic conversation, because there are people out there who really have no idea that it’s not safe. My in-laws used to enjoy riding their bikes behind the trucks that fogged with mosquito killer, too. That was fun. Would anyone do it now? No. Why? It’s not safe. That doesn’t mean that we’re all killjoys for mentioning it. When they make a plastic bag that is safe to boil in, I’m there. This is basically amazing. I never would have thought to do this!! I’m definitely making this in the morning – thank you SO MUCH for sharing this technique. I cringed at this too but then I remembered that the bags for my seal-a-meal are safe to boil in. I’m pretty sure that’s true of all of the bags of that nature. More expensive and it will take a bit to make the bags (you have to seal the ends w/o the suction on) but SAFE. @Debra that’s a great idea! I don’t microwave my food with plastic because 1. it creeps me out and 2. I can taste it. Using a glass jar of some sorts, or even a metal can would work just as well! Though they would get hot. I have a BakePacker in my emergency kit. That is how I learned to do these omelets. I love that it lets me bake things without having the oven on. Since I have an electric oven, but a gas stove, it was a lifesaver when my family was 12 days without electricity after a hurricane! Which is still their standard answer word-for-word on their web site. As our conversation progressed, I related to her about our successful history of making baggie omelets and it turned out that they do not endorse boiling in the bags for liability purposes. But you won’t find that stated on their website. We only use the SCJohnson brand of Heavy-Duty Freezer “Ziploc” Baggies. Reason: Because they don’t use BPA in the making of their bags and their bags are 100% dioxin-free. Only use a HEAVY-DUTY FREEZER QUART-size baggie. Reason: Heavy-duty freezer bags are thicker than a regular baggie. 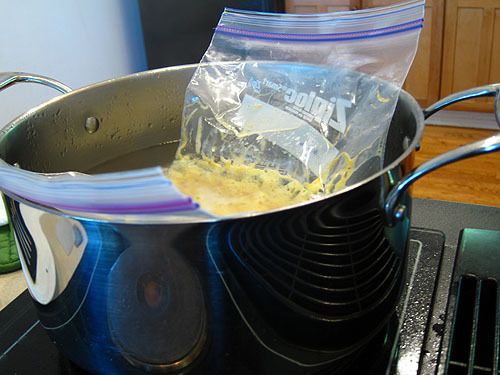 A regular baggie will not hold up well in the cooking process. We use quart-size for the cook’s safety and ease in handling while the baggie is in the pot. DO NOT use the freezer baggie with the sliding “zipper”. I believe they currently call them “Slider Bags”. Reason: It has the possibility of not sealing completely and the bottom of the baggie is an expandable bottom that opens into a flat base which would create a weird shaped omelet. NEVER let any baggie hang over the side of the pot. Reason: It WILL melt and quite possibility create a fire or at least ruin your pot. Fill your pot no more than 2/3 of the way full. Reason: This will allow for the water level to safely rise when adding in the baggies. After your ingredients are in the baggie, zip it closed about 90%. Gently squeeze as much air out of the bag as you can and zip it closed the rest of the way. Reason: This will allow room inside the baggie for the air to expand and not burst the baggie. It also helps keeps the liquid egg mixture down at the bottom of the bag. We always have someone watching the pot when baggies are in it. Not only for safety reasons, but to watch the omelets to make sure they don’t flow to one end of the bag creating a big “blob” omelet, and to move the baggie positions around in the pot every couple of minutes to get even cooking. NOT SAFE! You should never put store food in plastic, especially heat it! ALL plastic leaches many unknown chemical additives into food and no matter how many studies may be done on BPA or certain additives the truth is that plastic manufactures have the right to keep their “recipe” private meaning that consumers really do not know what any given plastic contains. BPA is just one of many additives that is getting press right now. Using plastic is horrible for your health and the environment!Please use Glass, Stainless Steel, Copper, Cast Iron or Ceramic for cooking. My Girl Guide troop used to make “eggs in a bag” for our camping trips. They are the most revolting things I have ever eaten. They were chewy, and tasted like plastic bag they were cooked in. Yuck. How about using oven roasting bags (the thin crinkly type) that are designed for high temperature cooking ?